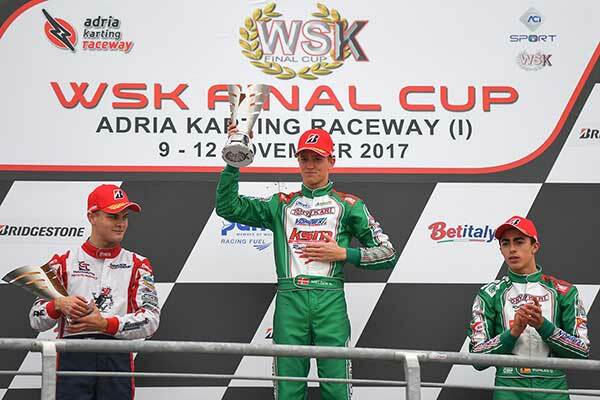 A nose cone penalty in his pre-final has cost Marcos Flack a starting position in the final at the WSK Cup round 2 at Adria International. Marcos won a race and was ranked 8th of the eighty 60 Mini drivers after the heats. Despite not taking part in the final, he still ended the series in 13th place. Coincidentally, Jack Doohan also finished the series in 13th place in the OK class due to points scored at the opening round. Full results from the round and series are HERE. 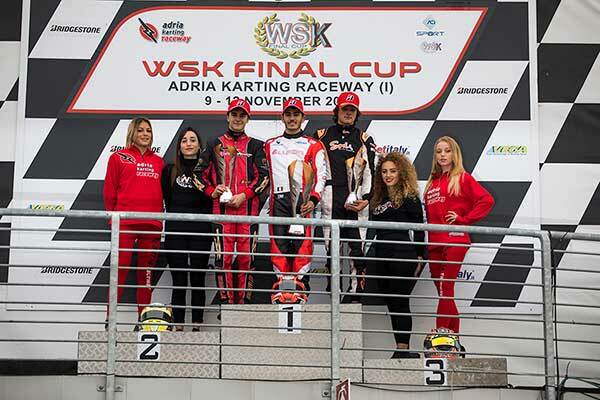 Gripping finale of the second round of the WSK Final Cup: winners scored success fighting inch by inch at the Adria Karting Raceway. 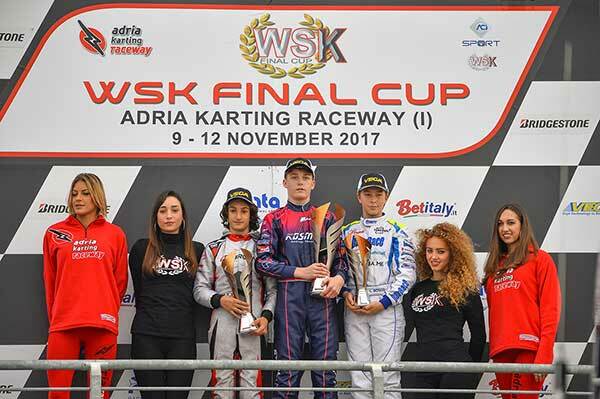 The result of the Finals turned standings upside down: it was a great way to say goodbye to next WSK season, beginning with the WSK Champions Cup, always in Adria (Rovigo, Italy) from 25th to 28th January 2018. It will be the first of the nine international events scheduled for next year. The OK Final were simply unbelievable: the Danish Nicklas Nielsen (Tony Kart-Vortex-Bridgestone) and the Italian Lorenzo Travisanutto (Zanardi-Parilla) battled for the victory until the very end of the race. They exchanged positions several times, but, eventually, Nielsen managed to win both the Final and the Series. Travisanutto, the runner-up of the race and of the Series, finished ahead of the Spanish David Vidales (Tony Kart-Vortex), who placed third also in the final standings. Thrilling finale in KZ2 too. The Italian Matteo Viganò (Tony Kart-Vortex-Bridgestone), the leader of the race, and the Italian Alessio Lorandi (Tony Kart-TM) made contact and went off track. This accident cleared the way for the Italian Francesco Iacovacci (Luxor-LKE), who grabbed the head of the race and won ahead of the Rumanian Daniel Vasile (DR-Modena) and the American Brad Benavides (Sodi-TM). Behind Iacovacci, the winner of the Series, Lorandi and Vasile. The Czech Roman Stanek (Kosmic-Vortex-Vega) was unbeatable in the Final: he took the lead of the race and secured both the victory of the race and of the Cup. Excellent second position for the Italian Gabriele Minì (Parolin-Parilla), who recovered from the fifth row and managed to finish ahead of the Italian Luca Bosco (Tony Kart-Vortex). The Russian Alexey Brizhan (Tony Kart-Vortex), who had grabbed the leadership after the Prefinal, dropped to second place followed by Bosco. 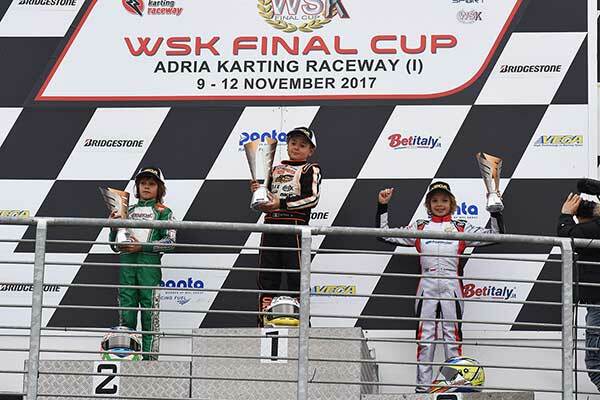 In 60 Mini, the Italian Alfio Spina (CRG-TM-Vega), who lost the victory last week, got his payback winning both the Final and the WSK Series. The former leader, Nikita Bedrin (Tony Kart-TM), was out of the Final. The Russian was overtaken also by the Italian Andrea Antonelli (Tony-Vortex) and the Polish Tymoteusz Kucharczyk (Parolin-TM), second and third in the Final and in the Series.